The Wave Prodigy 2 Running Shoes are optimised to get you running. Responsive, with plenty of superb cushioning from Mizuno's parallel wave technology and an enhanced fit thanks to the new updated upper. Jacquard mesh is used in the construction of the upper as it's extremely lightweight and comfortable. The mesh encases each foot in breathable comfort allowing air to fully permeate the entire upper. This construction provides a constant supply of fresh, cool air while simultaneously forcing out hot, muggy air that resides during intense activity. In addition, the upper features a hotmelt execution of overlays that add design, personality and increase the comfort. The overlays interlock with the lacing system to help provide a locked-in fit allowing the midfoot of the upper to wrap the foot comfortable and securely. Mesh is added to the collar and tongue to enhance comfort and provide superb ventilation for when the temperatures start to rise. Mizuno have used their innovative parallel wave technology in the Prodigy 2 which uniformly disperses shock throughout the sole, providing excellent cushioning and enhanced stability. The Mizuno wave provides flexibility in one direction and support in the other. The wave absorbs the shock without compromising the comfort or cushioning while the initial shock is then transferred back to guide the athlete onto their next movement. The Mizuno wave presents partial deformation and provides dynamic support to stabilize and guide the foot forward for better gait efficiency. Additionally, the midsole offers U4ic and U4icX midsole technologies. The midsole is predominantly made up of Mizuno's U4ic compound that rides and cushions like Mizuno's AP+ midsole, but is approximately 30% lighter without any loss of comfort or performance. U4icX resides in the heel area and is a light evolutionary midsole compound that delivers a more comfortable cushioned ride with higher rebound, thus fulfilling the most comfortable energised ride. Lastly, Mizuno have their Smoothride technology on the midsole which is an engineering approach to minimise the rapid acceleration and deceleration of the foot during transition, creating the smoothest ride possible. 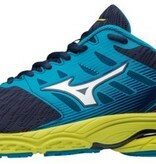 Linked between the midsole and outsole is Mizuno's Intercool system. this full-length ventilation system reduces heat and humidity build-up inside the footwear, working endlessly to ensure your feet stay cool, dry and comfortable. X10 is a highly durable carbon rubber that allows for longer wear in high impact areas and supplements traction at heel strike. This innovative compound ensures you have the best traction in testing conditions so you can perform at your optimal level.